Here is a children’s book which wonder-daughter got as a present when she turned two (thanks, uncle Matti!). And which we now re-discovered as her little sister is soon turning two: “Mein BulliBusBuch” (German for “My Kombi-Bus-Book”) by Birte Mueller, a beautifully illustrated short story of seven friends hoping on a bus one after another for a short road trip. The friends are all animals, so you can add the animal sounds when you read it to your child. The van is a split-window T1 bus (interestingly in a T2 color-combination, marino-yellow and creme white) where on each page one of the doors can be opened to look for the animals already inside. Just beautiful! There seems to be no English version yet when I checked on Amazon. The German version has the ISBN number 978-3-551-16840-5. Interestingly it also comes with the explicit approval of Volkswagen AG, probably to use the word “Bulli” in its title, for which Volkswagen owns the name (long story, check out this older blog post if interested). 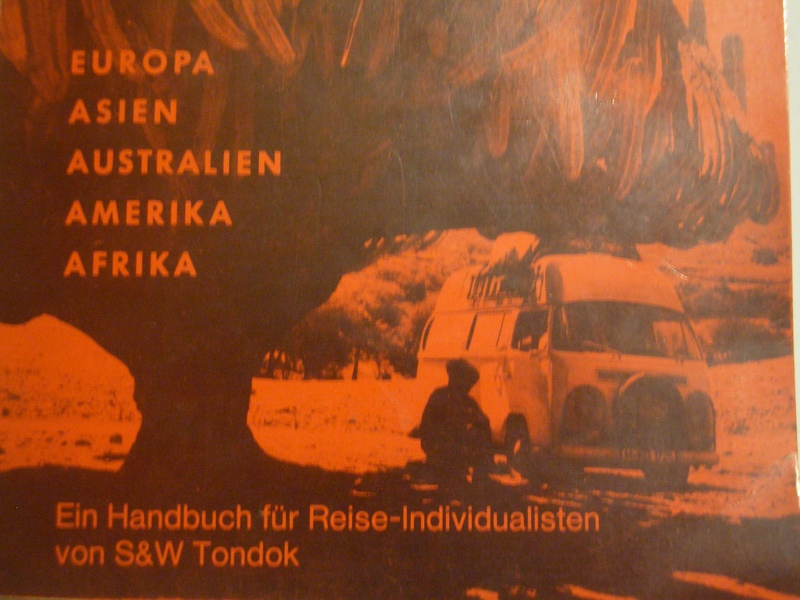 There is a kombi travel book that just stepped into my life for a second time in 20 years. It is the German book “Im VW-Bus um die Erde” (Around the World in a VW Bus) from Sigrid and Wil Tondok, first published in 1977. It starts with the actual travel report – quoting from the introduction: “five continents, six oceans, 49 countries, 250 000 km, highest height: 4.800 m (Peru), lowest point: 120 m below sea level (USA), 2 exchanged gear boxes, 3 exchanged engines, 16 brake pads, 18 shock absorbers, 36 tires, 85 flat tires, one accident, one attack, one war, one broken leg, one break-in, many insights”. The original early bay high roof bus used for all these adventures and shown on the book cover below was later donated to the German Museum in Munich (not sure whether on display or in storage at this moment in time). After the travel report comes a section on travel tips and recommendations, and finally one third of the book on how to rebuild a late bay window VW bus into a campervan, with many plans on how to build the bed, storage space and kitchen section. This became something like a bible when in 1995 I bought and started rebuilding our Old Lady, an empty 1978 VW panel van. At that time one could not buy the book anymore and hunting for second hand books on Amazon was still far away. I remember that I finally found a copy in the public library in Dortmund in 1996 and photocopied the complete book to have it as a guide for building the Old Lady. Now, twenty years later, an old friend contacted me and asked whether I was interested in this book – she had just found it amongst the books of her brother who had passed away many years ago and way too young. So now I am sitting here with an original copy in my hands, of the fourth edition from 1981. Her brother had in some ways been like a big brother to me when I bought the Old Lady. An electrician by trade and generally a very gifted craftsman, he had helped me to install a radio, extra fog lights, additional high beams, and additional instruments for battery and oil temperature. He welded a rusted through section (under the passenger seat) and helped me to clean and repaint the underbody, using his pressure washer and lifting platform. He re-built an original VW bus main light pull switch into a two-step fog light switch (front and rear) which served me well for 15 years and is still installed in the Old Lady. Thank you, Anke, for sending the book to me. And it is an honor to receive this book of yours, Holger. So sad that we did not have more time together. You would have enjoyed what a kombi nerd I have turned into over the last 20 years. And I could have done with much more advice and help from you over those years. Thank you for all the help you gave me. 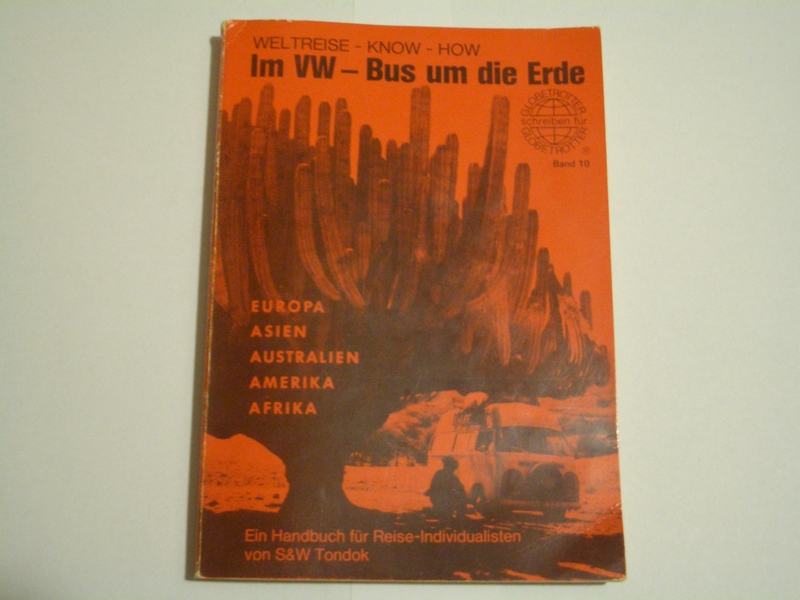 PS: Today, the authors run their own publishing company for travel books which started with this book, “Im VW Bus um die Erde”. And while the book is not in print anymore, they were generous enough to make the complete sixth edition from 1989 available in the web! How amazing is that! This edition also includes rebuilding recommendations for the T3 VW bus from the 1980s.